With sudden climate changes, Summers are getting hotter year after year.Sometimes it difficult to bear the heat.Many feel irritated and loose control while sweating.Bad smell coming from body while sweating will make you and other feel very bad. Especially while working in office with no Air condition will be a hell. With evolving technology, we have a new invention from Japanese. 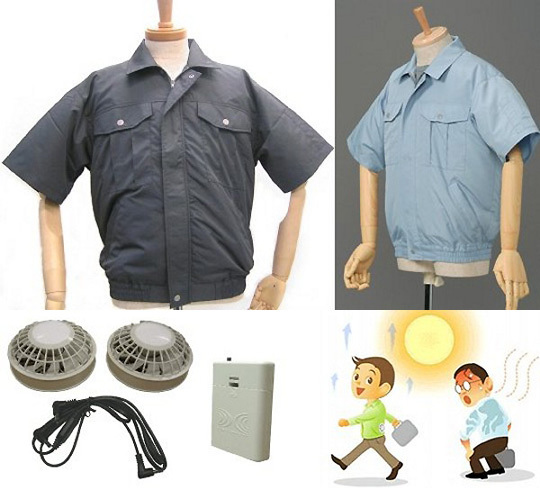 Its Air-Conditioned shirt named Kufukucho keeps you cool while you are at work or walking in Sun. This shirt looks just like other old shirt on outside,but its different inside. It got two battery powered fans continuously cooling you down as you go out without breaking sweat. But always cooling you inside is not cheap. This shirt comes with a heavy price tag of $186 (USD) from Japan Trend Shop.